Wow. 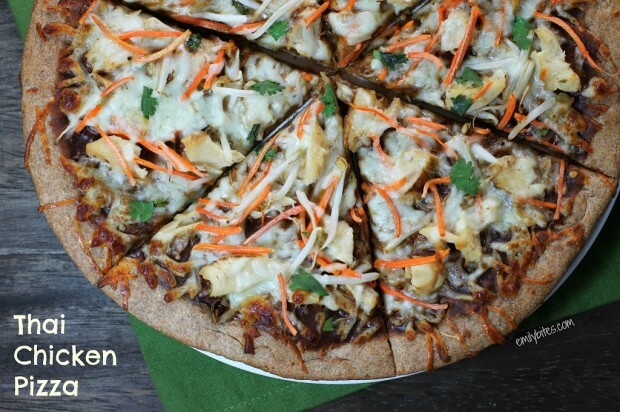 I haven’t posted a pizza recipe in a while, but trust me, this Thai Chicken Pizza was worth the wait. Ever since I made peanut sauce using PB2 (affiliate link!) for my Thai Chicken Skewers I’ve been wanting to use that sauce again on something. It’s rich and peanut buttery with an Asian twist from the soy sauce and sesame oil and little heat from the Sriracha and black pepper. Altogether the flavor is incredible. Honestly, you could probably dip a brick in that sauce and I would want to eat it. Luckily for you, I decided to forgo the brick recipe and instead make this super delicious pizza. You’re welcome. I always use Boboli Whole Wheat crusts because I like the way they taste and when I want pizza I want it to be quick and hassle-free, but if you love making your own pizza dough feel free to substitute a homemade recipe (will change nutrition info). Don’t forget to check out my Easy Slow Cooker Shredded Chicken post- the perfect way to make shredded chicken for this recipe! I’m excited to report that since posting my Thai Chicken Skewers and PB Banana Green Smoothie recipes I’ve received lots of comments saying PB2 is now available in many national and regional grocery store chains. If you’re unable to find it at your grocery store, you can order it on Amazon (affiliate link) like I did! If you’re unfamiliar, PB2 is a powdered peanut butter that gives you all the flavor of traditional peanut butter but with significantly less fat and calories. I waited a long time after hearing rave reviews to actually try it and now that I have I can’t believe I waited so long! I’m definitely planning to make more recipes with it (dessert next?!) so stock up now! Looking for other pizza ideas? 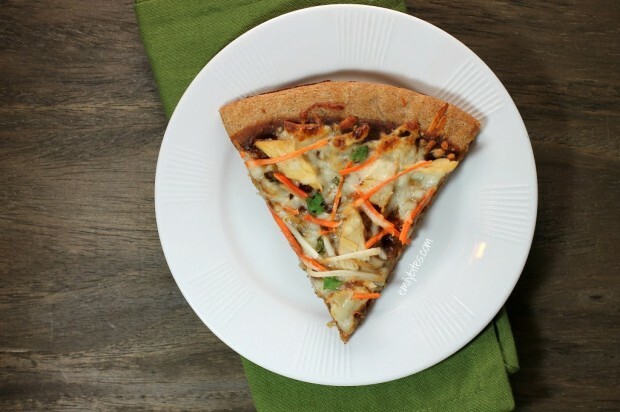 Check out past recipes for Chicken Alfredo Pizza, Cheeseburger Pizza, Buffalo Chicken Pizza, Margherita Pizza, Meat Lover’s Pizza, Bacon, Egg & Cheese Breakfast Pizza, Pepperoni & Pineapple Pizza, Mexican Pizza or Barbecue Chicken Pizza! In a medium bowl, combine the PB2, soy sauce, water, garlic powder, black pepper, sriracha, brown sugar and sesame oil and whisk together to combine. Spread the peanut sauce evenly across the top surface of the pizza crust, leaving at least a ½ inch edge around the outside. Sprinkle the chopped chicken pieces and scallions over the top, followed by the mozzarella cheese. 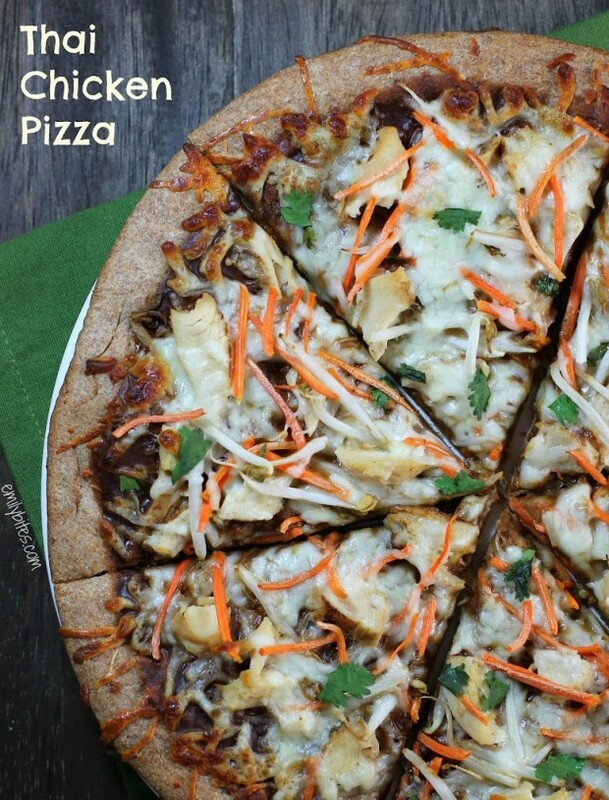 Finish the pizza by sprinkling the carrots and bean sprouts over the top. Place pizza on a foil covered baking sheet, a pizza stone (my preference) or straight onto the oven rack (depending on how you like your crust) and bake for 8-10 minutes. Sprinkle chopped cilantro over the top before serving. It’s Asian hot sauce and it will change your life. SOOOOOOOOOOO GOOD. I made this pizza for dinner last night and it was delicious! It was your spicy sausage pasta for dinner tonight and I have chicken marinating to make your Thai chicken skewers with peanut sauce for dinner tomorrow night. Everything has been fantastic!! I made this for dinner last night and it’s AMAZING. So, so, SO good. I think these same ingredients would be amazing as a wrap, with the sauce drizzled on top!! Gonna have to try that next. I cannot tell you how much I love this pizza. The sauce is so incredible. 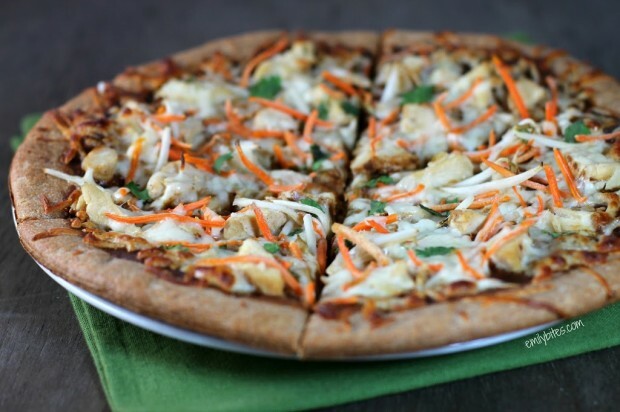 When I was younger, I always wanted to go to Schlotzsky’s because of their Thai chicken pizza. Then they stopped making it. Then they brought it back, and it tasted like crap!!! This version is WW friendly, super easy, and tastes so amazing I made it THREE times in a row! Thank you! Love thai…love peanutbutter! So win win for me. Wasnt my family’s fave but I expected that based on knowing their likes. Was out of pb2 so I used real peanut butter and I added lime juice. Sounds weird but it made it perfect! I made this last weekend and my family LOVED it!!!!!!!! Making it again tonight for dinner, can’t wait!!! YUMMY!!!!! Trader Joe’s now carries a cauliflower pizza crust. 80 calories a slice, 240 for the entire crust! I made this last week and it was delicious. I happened to have all the ingredients on hand except for the premade pizza crust. Lately I’ve been really loving that two ingredient dough that is all over social media, including your blog, and I made that my crust instead. Amazing! I’m super sensitive to spicy stuff, so I didn’t use any Sriracha, but I think I will give it a try it next time. Thanks for another winner!